After we spent the Family Day long weekend in the hospital (two visits to emergency), Astrid’s health has improved. She had her first virus that didn’t end up in a trip to emergency (she ran a fever for 36 hours but bounced back after a few days) and she’s been healthy for the last week. It feels like a precarious situation, but we’re trying to enjoy it for now. Astrid is busy expanding her vocabulary. The biggest highlight is that she can say her name, or a lispy version of it. And she’s working on the names of other people in her life. 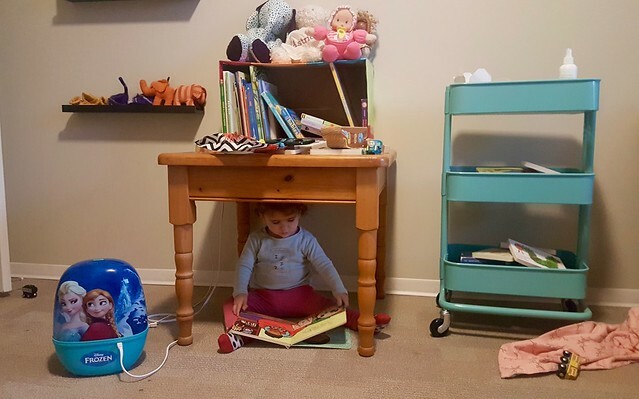 She’s getting pretty good at using her words and actions to order us around (dragging us around the house, “bottle”, “book”, pat a chair to indicate we should sit there). 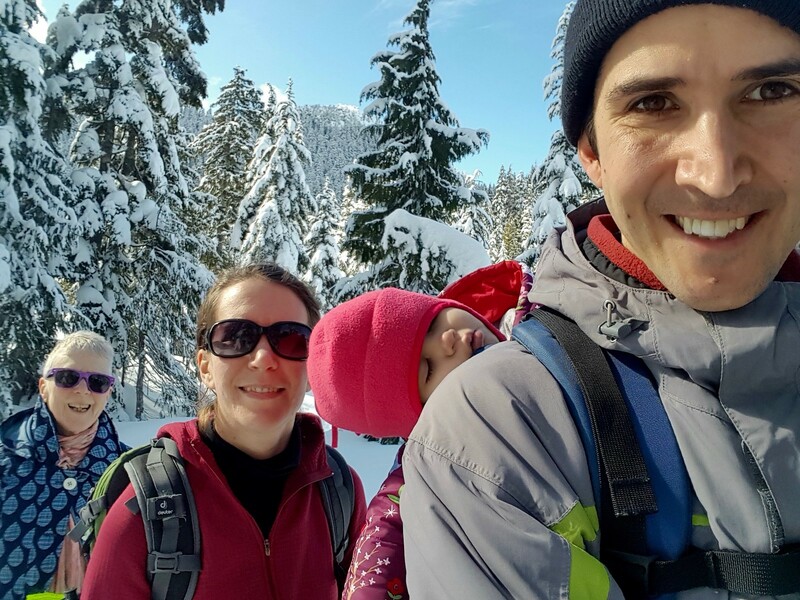 We had a lovely snowshoe to the Bowen Island Lookout on Cypress Mountain yesterday (photos). 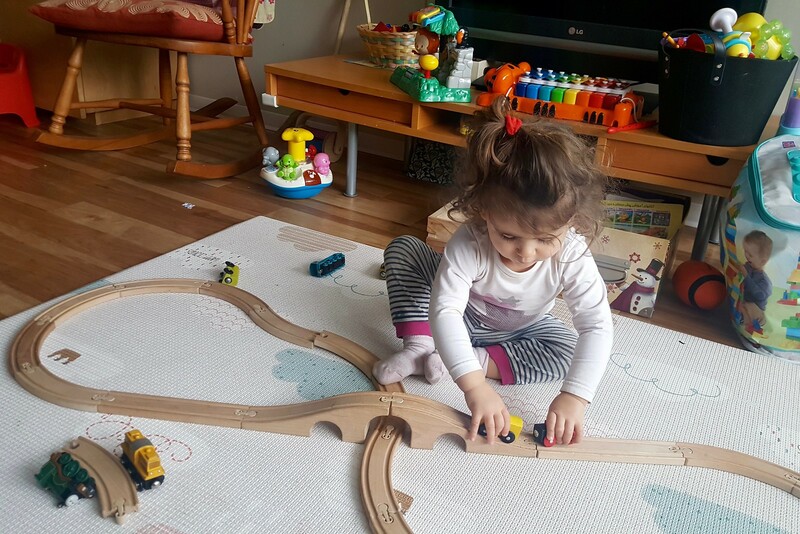 Astrid is loving her trains and lego. 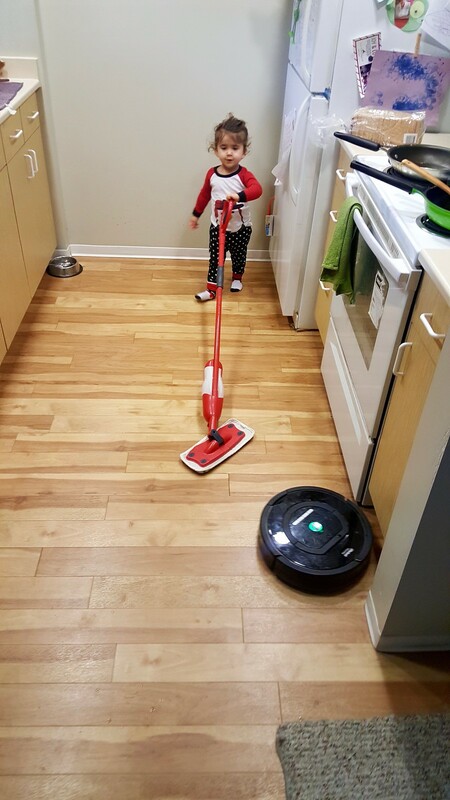 She’s a big help around the house. Fresh air is good for the lungs. January was a rough month. 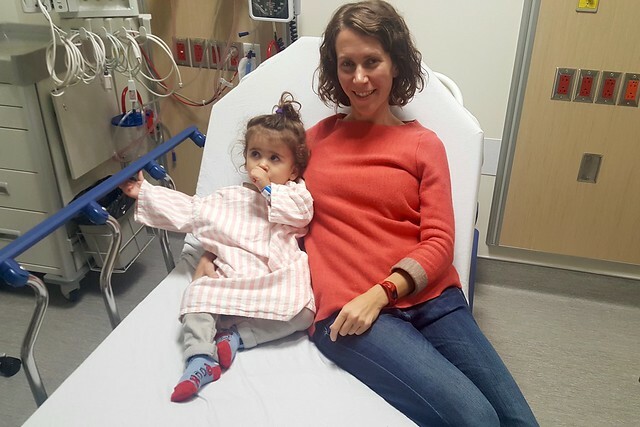 Astrid got the flu, had a high fever twice, saw numerous doctors, got a black eye when she fell in the tub, and spent far too much time at the hospital. 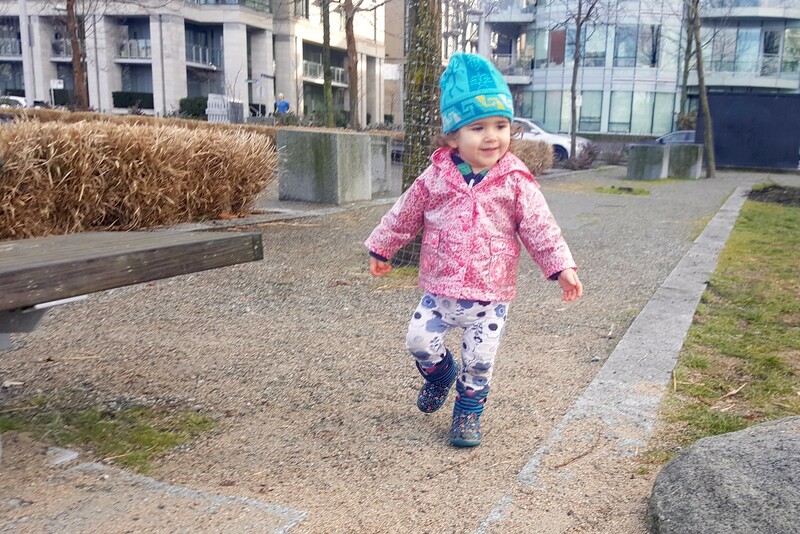 We ended up in the emergency room at BC Children’s again on January 10th. It was our second visit for Astrid’s wheezing. The good news was that she responded really well to the puffers and we learned a lot from the doctors. The bad news was that she officially has asthma. We were out of the hospital in 5 hours with a referral to see a paediatrician who specializes in asthma. A week later, the doctor reassured us that most young children with asthma grow out of it. She prescribed a new puffer, a corticosteroid called Alvesco, that’s supposed to reduce the inflammation in her lungs and prevent future trips to the hospital. And we were told to come back in April when cold season is over. Unfortunately we ended up back at emergency on January 26th. This time we stayed overnight. 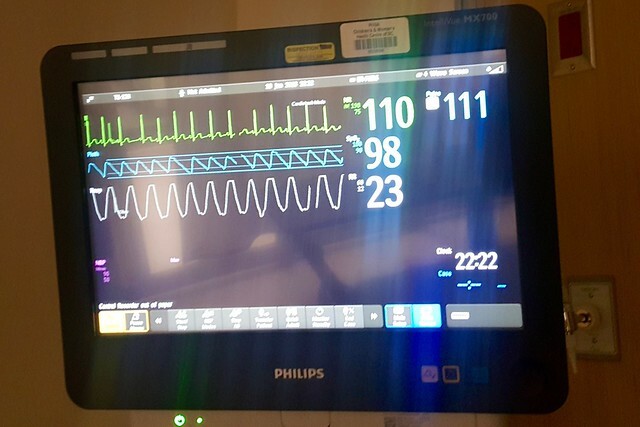 We’re pretty used to the drill by now (The Asthma Protocol); the nurses just hook her up the monitor, hand us the puffers, and leave. Hopefully the Alvesco just didn’t have long enough to kick in (it’s supposed to be slow-acting). 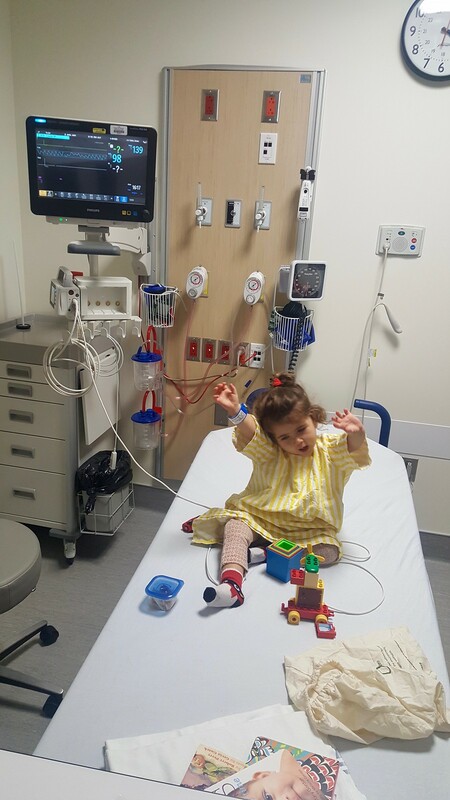 As good as the treatment is at BC Children’s Hospital, we don’t want to be back anytime soon. In between hospital visits we had two great weekends with Baba. She and Astrid had a lot of fun together. 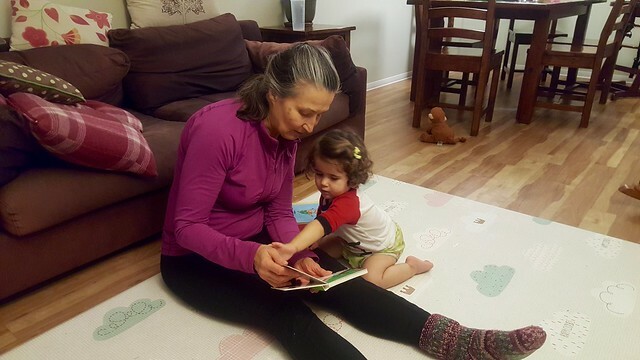 You can read her blog post about the visit and her time in Kamloops. While Baba was here we thought it would be nice to go for a snowshoe in the mountains. 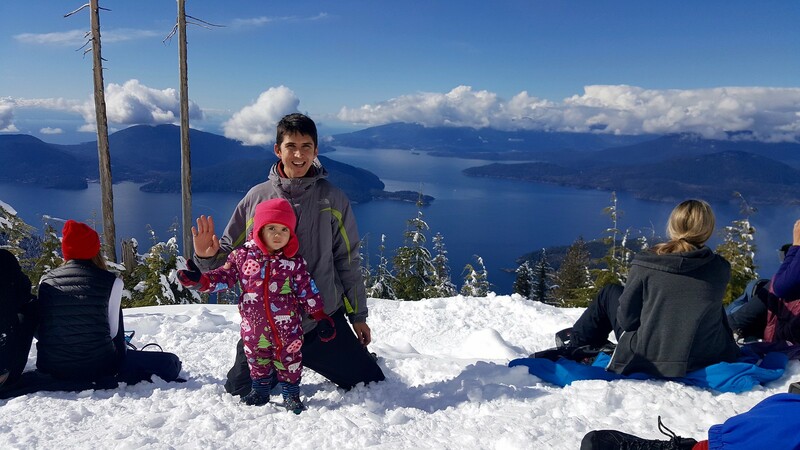 We planned to do Bowen Island Lookout Trail on Cypress Mountain. On the drive up we kept on waiting for the rain to turn into snow. But all we got at the top was a frigid wet sleet coming down at a diagonal. 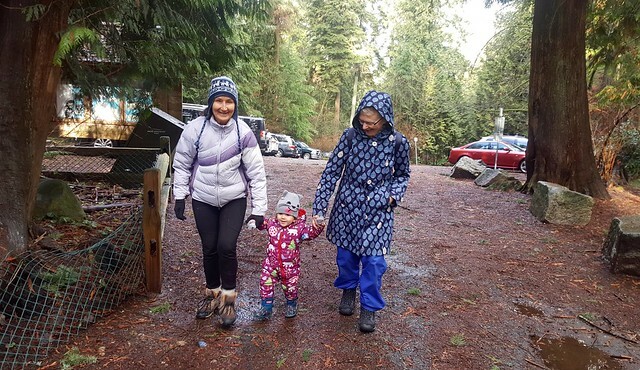 Not the best conditions for a frolic in the woods with a toddler and two grandmas. Luckily it was dry and periodically sunny at Lighthouse Park so we still got a little hike and picnic lunch. 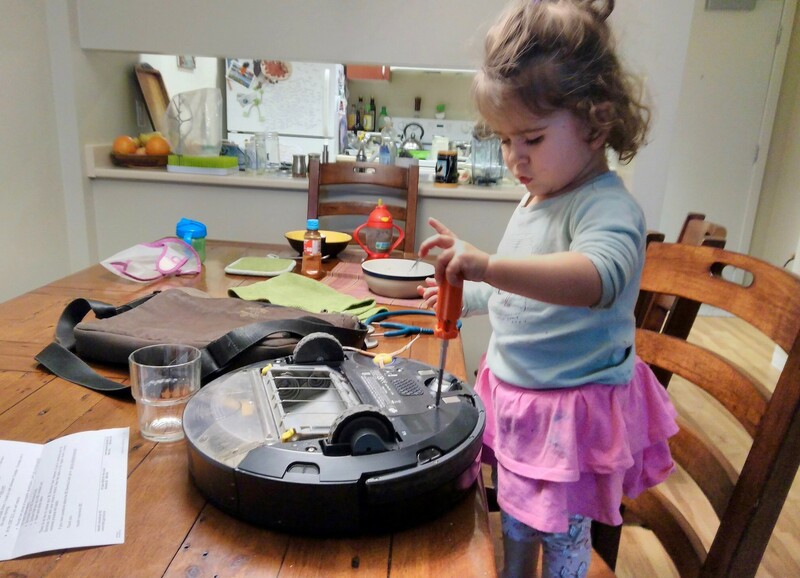 Astrid continues to learn new skills, expand her communication, and charm the pants off everyone she meets. She knows her body parts (toes, head, nose, ears) and a couple of animal sounds. 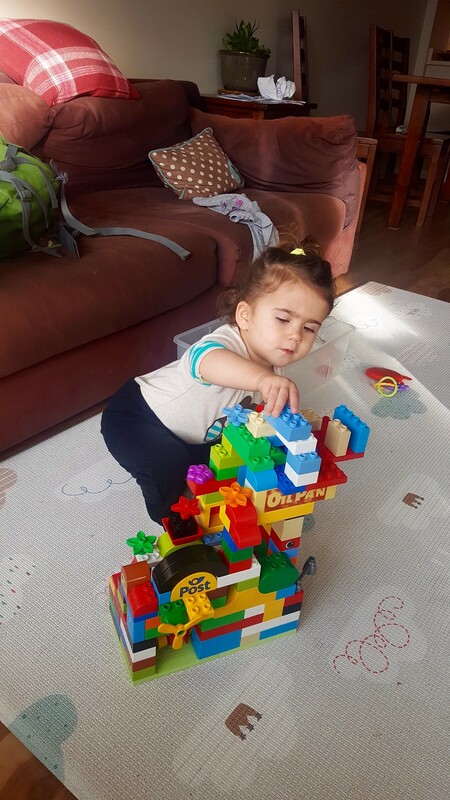 She’s really into putting things where they belong – helping us put away our shoes, cleaning up blocks, disposing of trash in the garbage can. One of her favourite games is to see how many of her sweaters and jackets she can wear at once. She just keeps on bringing you new layers to put on her. Once she can’t move anymore she starts bringing your jackets. 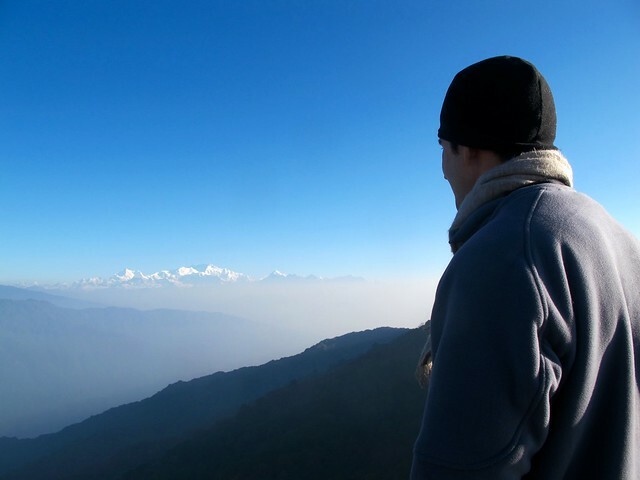 The Singalila Range forms a ridge of hikeable mountains along the India-Nepal border that offer awesome views of the Himalayan mountains including Kanchenjunga, the third highest mountain in the world (8598 m). 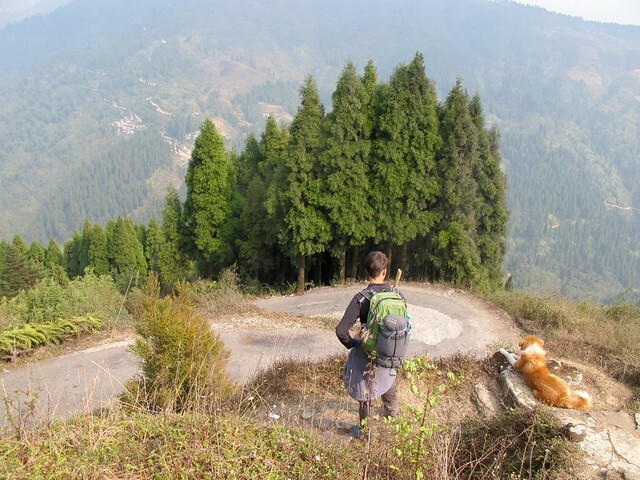 We set out to do a 5-day trek from Maneybhanjang (near Darjeeling) to Phalut, but unfortunately didn’t make it all the way. The first day I was really slow going up the 11 km with over 800 metres elevation gain. That night I was so chilled and achy I couldn’t sleep until the wee hours of the morning. All night all I could think about was the 21 kms we had to cover the next day and the ascent up to 3636 metres above sea level. I was feeling better the next morning but knew I didn’t have enough energy to complete the day. We were lucky to have views of Kanchenjunga that morning before heading back down to Maneybhanjang. We were both disappointed about not making it to Sandakphu and Phalut, the two peaks with amazing views, but knew it was the right decision. We weren’t in the national park yet so we could do the descent without a guide, at least a human one. We had three different dogs join us for different parts of the day. 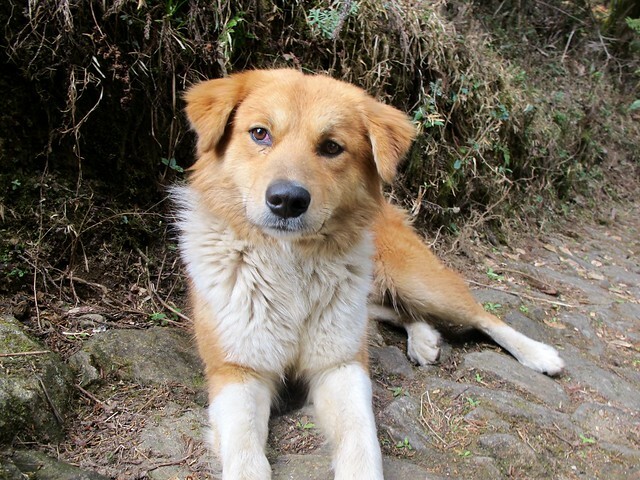 They were just village dogs that seemed to want a little company and a journey. They responded better to petting than treats. This one was our favourite, we named him Charzing. 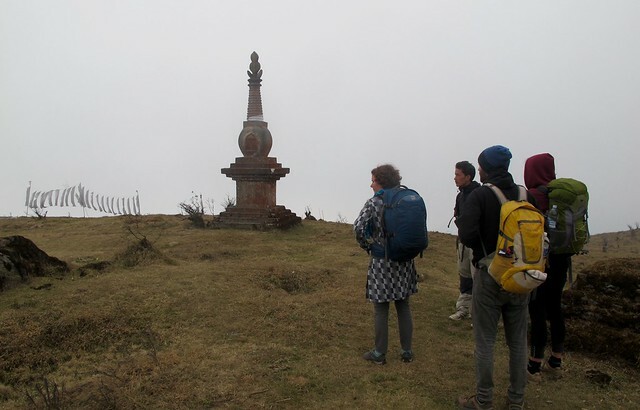 Tour companies will arrange all-inclusive Singalila Trek expeditions for around 3000 rupees per person, but we’re cheap and resourceful so we planned our trek on our own. 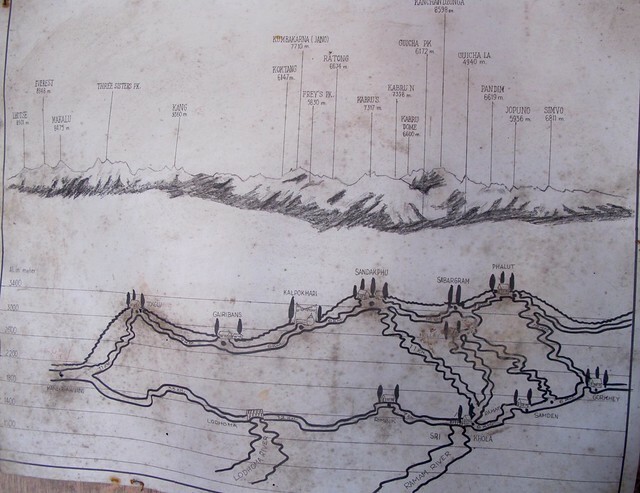 We wanted to create a comprehensive guide to the trek for others to follow, but since we never made it past Tumling (near Tonglu peak), our knowledge is incomplete. But here is what we figured out. There are two standard treks out of Maneybhanjang. 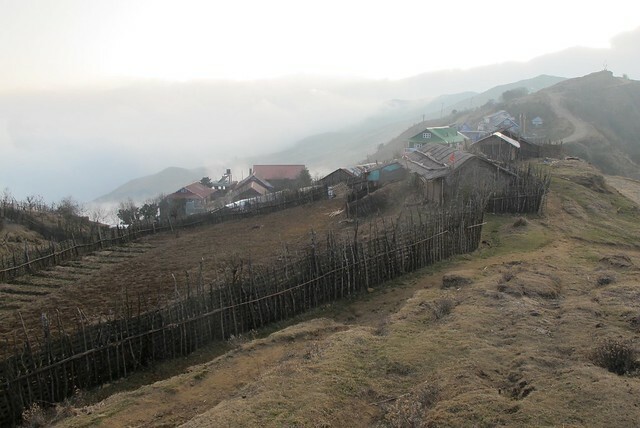 A 3 day-trek to Sandakphu and down to Rimbik or the 5 day trek that goes to Phalut. Phalut has 360-degree views from the peak (3600 m) so that was the trek we chose. 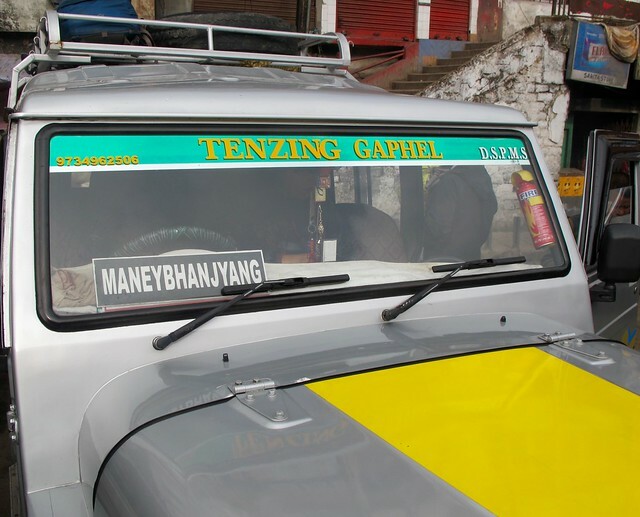 We took a shared jeep from Darjeeling to Maneybhanjang in the morning. Apparently it’s not a very popular route. 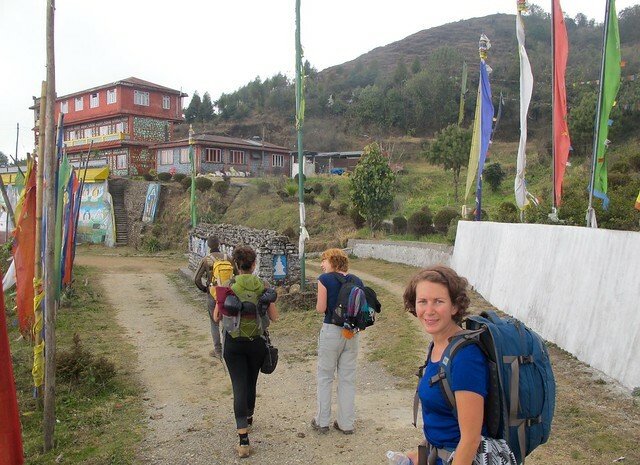 There were three other foreign tourists going to do the same trek and no one else. After waiting for 30 minutes we paid for the remaing five seats so we could get trekking at a reasonable time. We ended up trekking with our new friends to help share the costs. Most of the hike is in the Singalila National Park, which requires visitors to be accompanied by a guide. 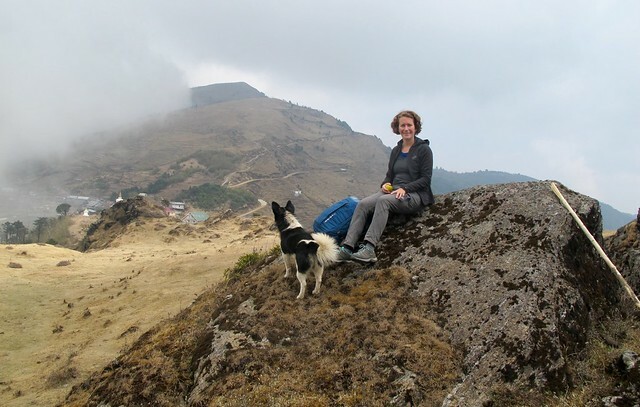 If you’re not using a private tour operator, you can get guides through the Society for Highlander Guides and Porters Welfare (link), whose mission is to preserve the park and create employment opportunities for youth. The cost is 1200 rupees per day, including food and lodging for the guide, no matter how big your group is. There are government and private lodges along the way, as well as snack, water, and lunch huts. We only stayed in one, which was lovely. We had our own room with three beds, lots of blankets, and a washroom (cold water and squat toilet) for 800 rupees. 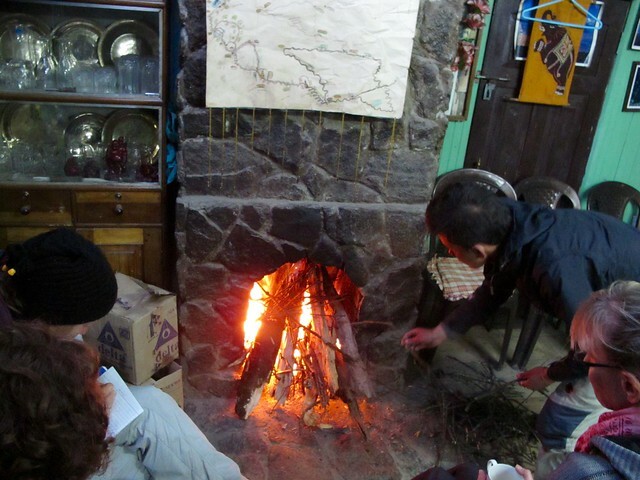 We spent most of our time in the main house with the other guests by the fire. Lunch was either chowmein or noodle soup for 50 rupees and egg could be added for 20. Tea and water were a little more expensive than usual, 15-20 and 30 respectively. The one dinner we had was amazing (although I didn’t eat much) – dal, rice, veg curry, potatoes, fried bitter gourd, egg curry, raw veggies, and apricot dessert – for 150 rupees each. 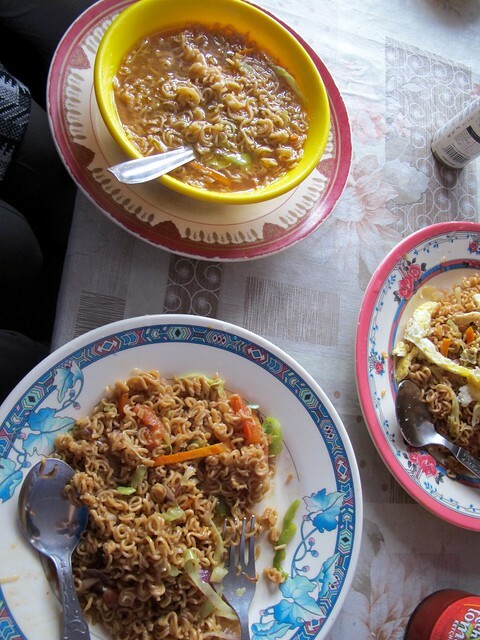 Breakfast was porridge, Tibetan bread, honey, jam, and a boiled egg for 100 rupees. We didn’t hire a porter and carried our own gear. We probably brought too much stuff. 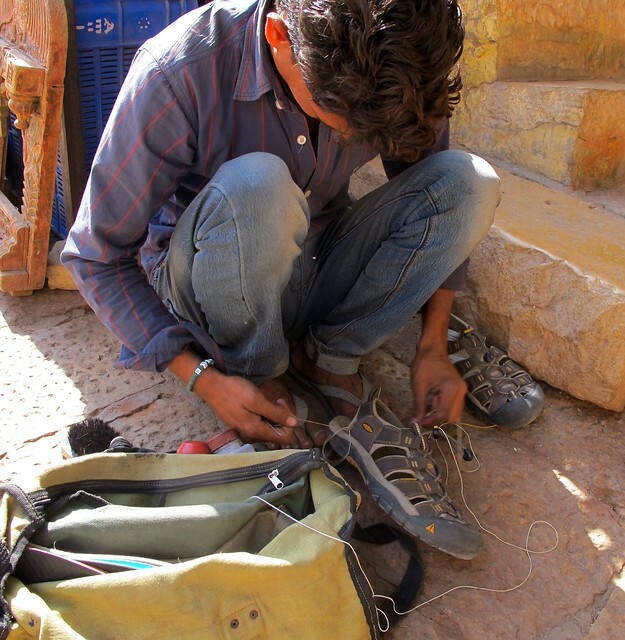 I would recommend packing lite – only bringing a few days of clothing, warm hat and gloves, and a headlamp. 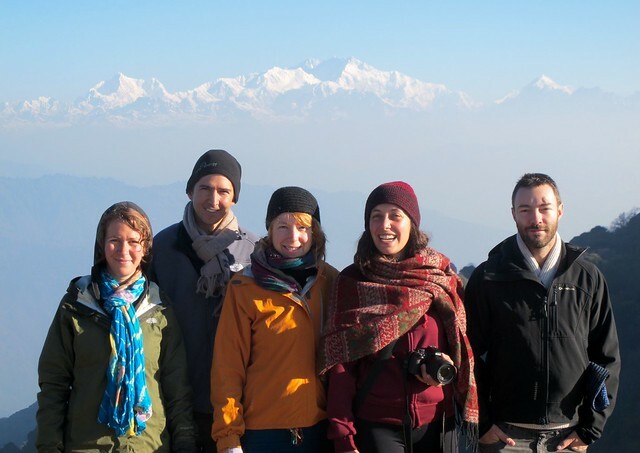 We rented down sleeping bags in Darjeeling for 80 rupees a day from Trek Mate. We didn’t need them in Tumling as there were plenty of blankets. We also foolishly brought snacks from Darjeeling that we could have bought at any of the tea stall that dotted the trail. February 11th was the halfway point in our trip. Two months in, two months to go. Feels like we’ve seen a lot already, but we still have moments when we have to remind ourselves in disbelief that we’re in India. 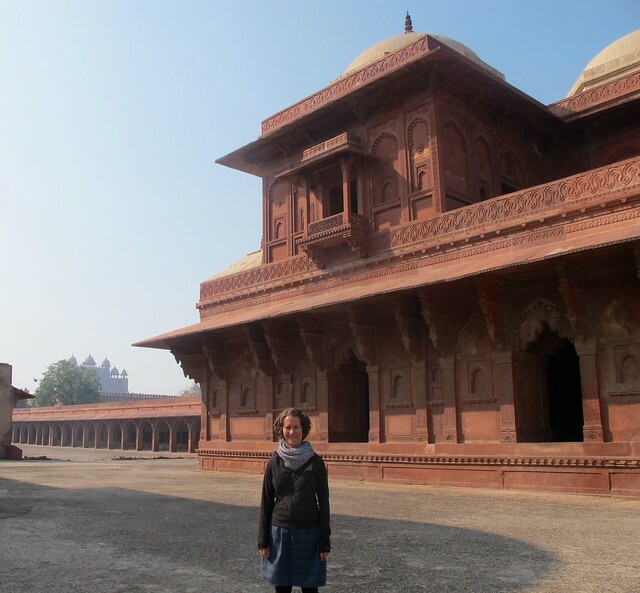 We’ve made a few stops in northern India and are starting to get a taste for the region. We had been told that there are a lot of differences between north and south. So far, we’re finding some of them to be true and others not. The weather is different, the food, and our fellow travelers, but we’re not finding the touts and scammers to be more aggressive as we’d been warned. Agra was chillingly cold weather (at least it felt like that to us), but now we’re in the desert and it’s getting hotter fast (it’s dry and 33 degrees). I’m glad I didn’t buy a second sweater. It’s still reasonable at night and in the shade, which we’re very thankful for. But you really can’t do anything in the middle of the day. Hindi is widely spoken amongst locals and that will likely be the case until we’re in West Bangal. So we’re finally taking the time to learn the basics. So far we have hello/goodbye, 1 to 5, OK, and thank you. Generally everyone is appreciative and actually seems to understand what we’re saying. Somehow it seems that people’s English is better too, probably because there are more foreign tourists. 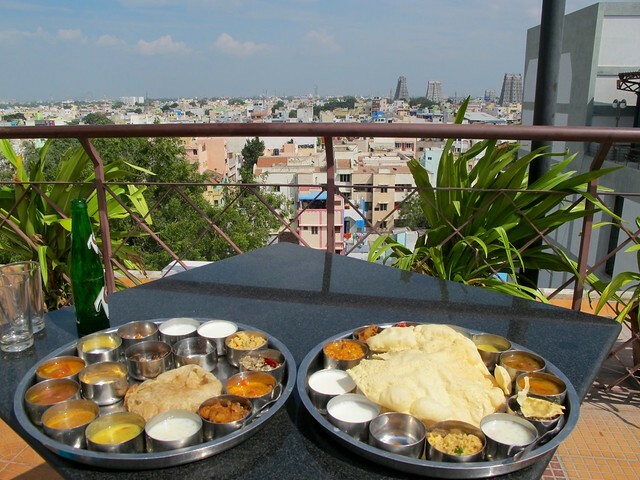 The food has changed – more wheat, meat, and dairy; less rice and fresh fruit juice. 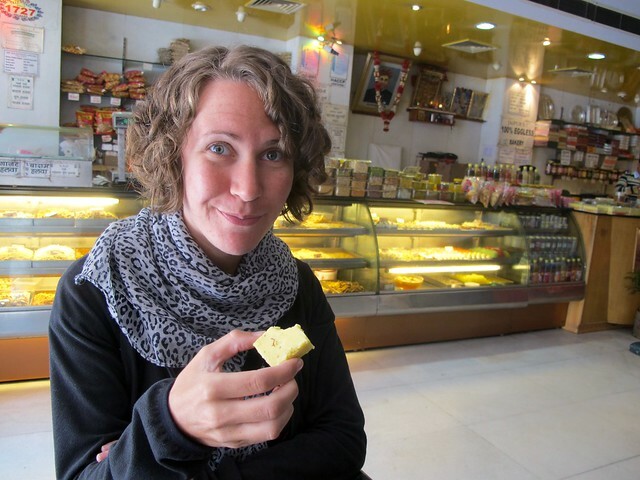 We’re happy that it’s still easy to find vegetarian food, but are having to be more vigilant about paneer. We’ve sampled a bunch of new kinds of deep fried bread and sugary sweets. Our favourite new kind of food is anything done in the tandoor oven, like tikki vegetables, kebabs, and naan. Tandoori is not just for carnivores in India. A lot more foreign tourists visit northern India, especially on short term trips (less than one month). This tends to change the dynamic of restaurants, activities, and sites. People are willing to spend more money because they are constantly converting to their home currency. 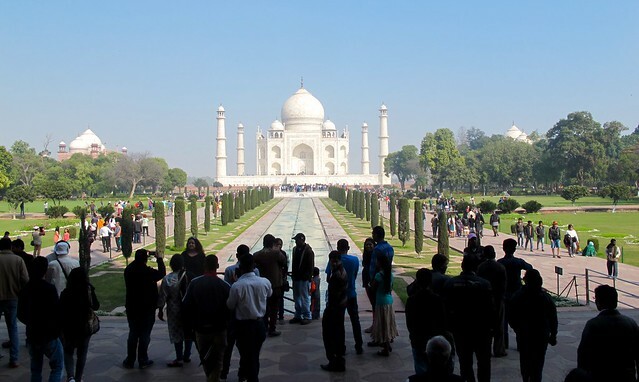 There are more coach tour buses and quick ways to “experience” quintessential Indian things. But we’re generally on a different path (sometimes literally) than these folks except for some of the big, must-see sites. Our bodies and our belongings are managing to hang in. No more stomach issues (knock on wood), but we keep catching colds. I think I’m on my third and this one really knocked me out. Our skin is getting brown, or at least the tops of our feet and back of our necks. 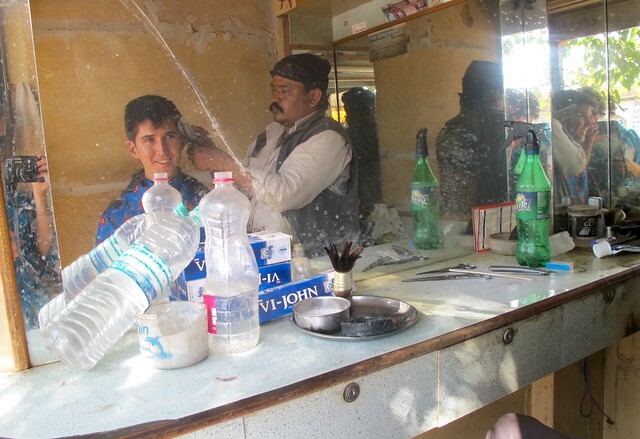 After a few weeks of looking pretty shaggy, Chris got a haircut at a roadside barber. Our clothes have mostly survived hand washing, wringing, and sun drying. Chris got his sandals sown up the other day where they were beginning to tear. We’re starting to take bets on which items won’t make it home – odds on favorites include Chris’s underwear and Emily’s sandals. The second half of our beach vacation was surprisingly different from the first. 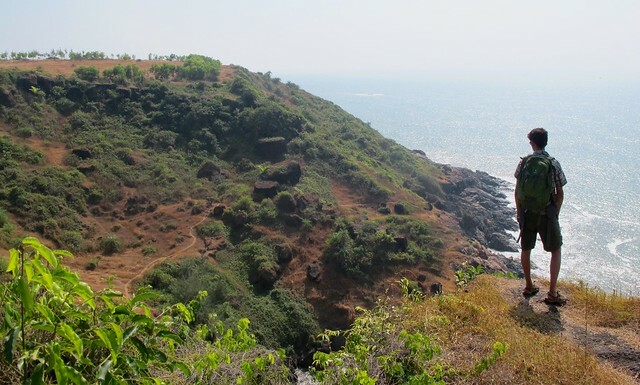 Gokarna is definitely quieter and less developed than Arambol. It seems that new restaurant/accommodation joints are opening every year, but there isn’t much else. And yet the demand still exceeds supply, especially on long weekends (we were there for Republic Day). 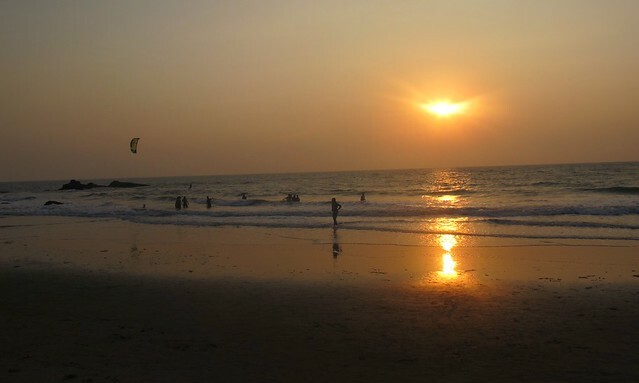 There are three main beaches: one in town used mostly by pilgrims, Kudle Beach, and Om Beach. The beaches are smaller and separated by rocky cliffs of green, red, and black. Getting to Gokarna from Arambol was a long process involving two taxis, two trains, a security checkpoint looking for drugs, and a lot of waiting around. We left at 8 am and arrived at 5 pm, just to get 200 kms south. We travelled with a French girl and a Finnish guy, which helped pass the time and split the cost of the taxis. By the time we got to Om Beach, none of the places mentioned in our guide book or reviewed on TripAdvisor had any space left. The best we could find was a dark, cell-like concrete room with shared pit toilets for $5 a night. I was pretty grumpy after all that and was not impressed by our new accommodations. 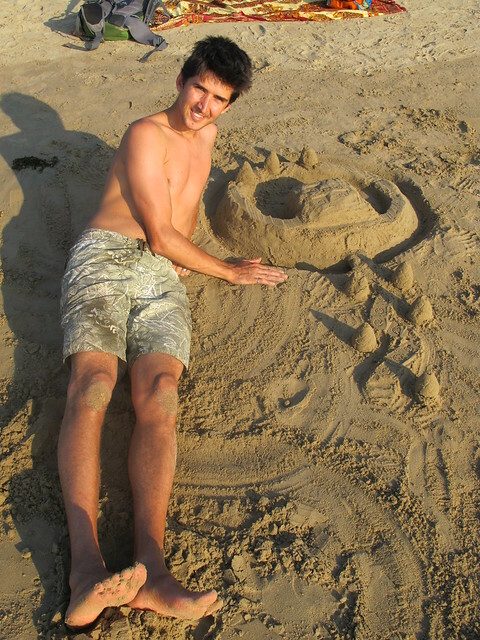 The next morning Chris went for a run to Kudle Beach and checked for available huts there. 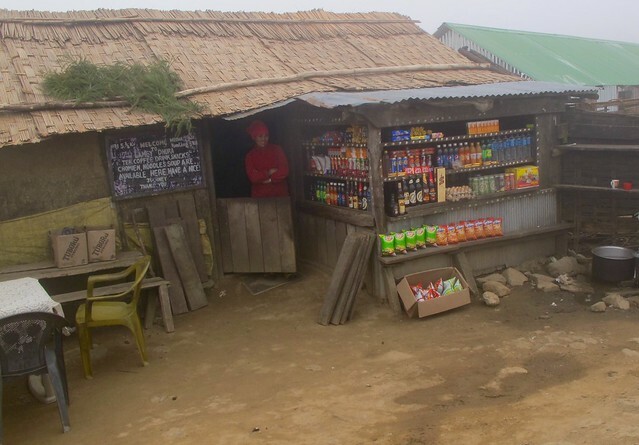 Most places were full, but he found space at Sea Rock Cafe, which had basic huts for $4, rooms with pit toilets for $8, and rooms with western toilets for $12. We splurged for the western toilet and larger room. 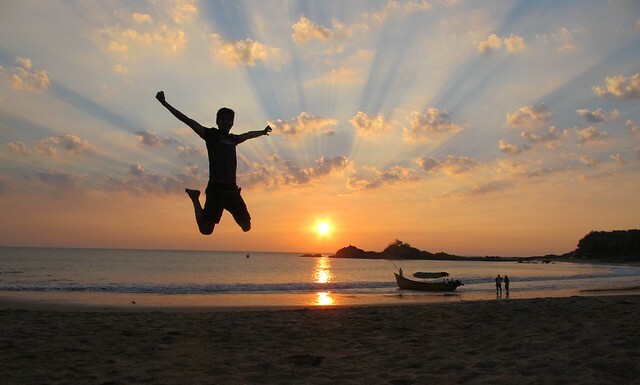 Our experience with huts in Gokarna made us appreciate how good the rooms were at Laughing Buddha in Arambol. 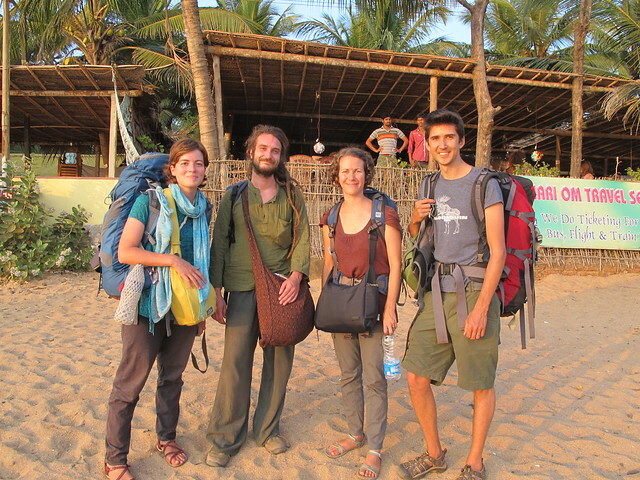 Arambol and Gokarna were our first experiences waiting to find a room until we arrived in the place. We didn’t really have a choice as it’s the modus operandi. All other accommodation has been booked online directly or through a booking website. The benefit of finding accommodation when you arrive is you know what you are getting and you can shop around. The downside if it is busy is you end up walking from place to place and finally settling on something less than ideal. It’s easier when all accommodation is in one central place, but I still prefer booking ahead. 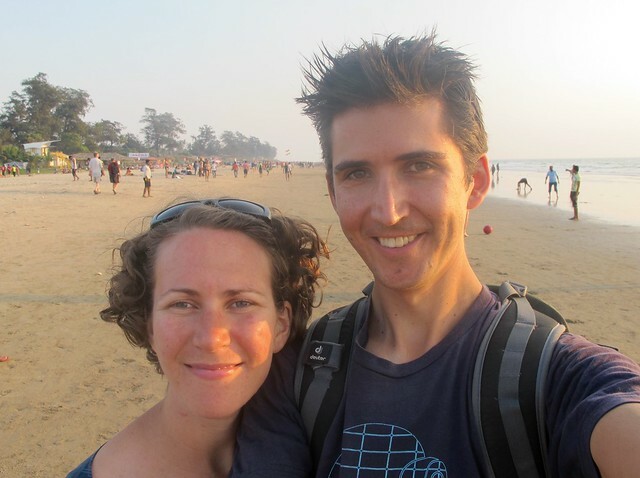 We spent our time in Gokarna relaxing on the beach, swimming in the wicked surf, hiking between beaches, and building sand castles. We went to one yoga class, but it was too advanced for us – with a lot of time spent on head stands and pretzel poses. It’s three days later and I’m still sore. We’re now heading to Mumbai. It’s going to be quite the shock after 9 days of beach relaxation. 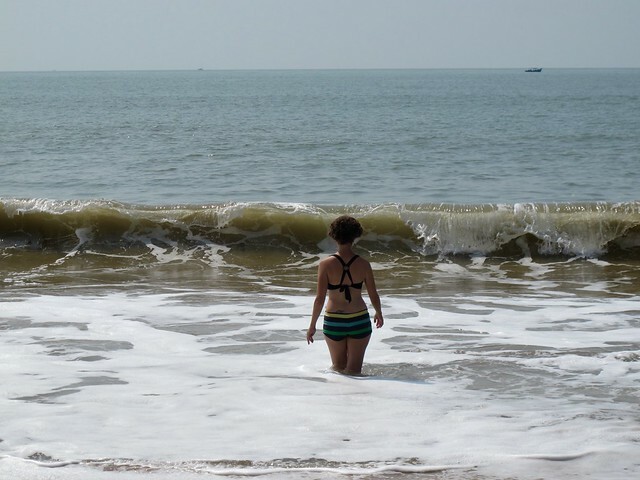 This week we finally hit the beaches of India. 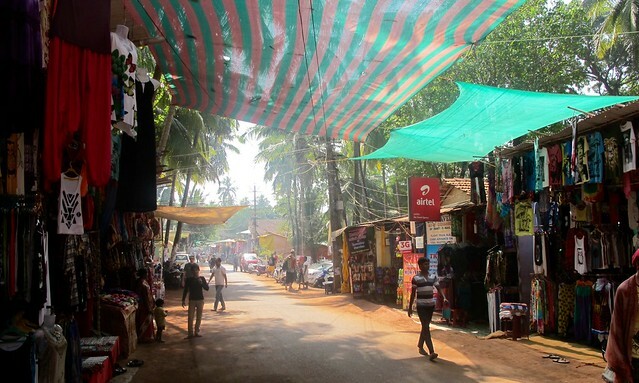 Our first stop was at the North end of the state of Goa, Arambol. 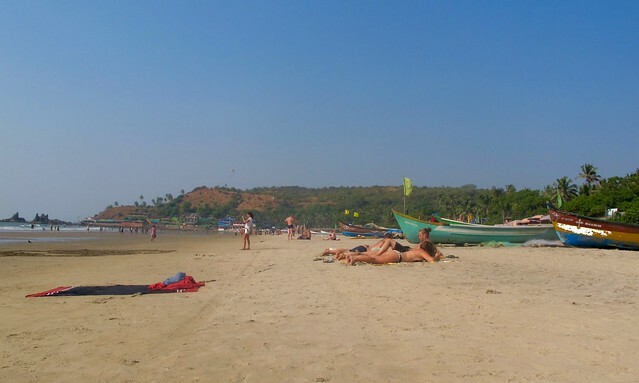 Goa has a reputation that has changed over the years since it became popular with foreigners 20-30 years ago. 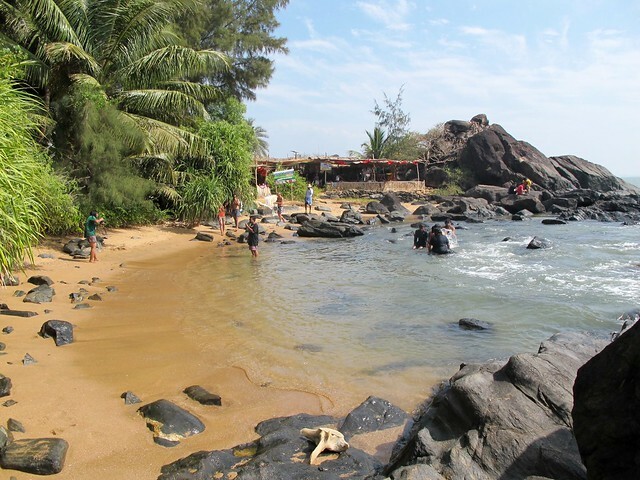 We had heard that it used to be this untouched gem of beautiful beach that hippies had discovered and made their haven. But the word got out. Personally, I wasn’t expecting much because I heard it lost its charm. I was actually pleasantly surprised. Yes, there are tons of foreigners, many of which are visiting from Russia, and the beach is lined with restaurants and shops selling only what they think we want (french fries, pancakes, sarongs, flip flops, and techno beats). But we were very happy to take advantage of the expansive clean white beaches, cheap hut accommodation, and health-conscious food (organic, vegan, even raw) in a pretty hassle-free environment. 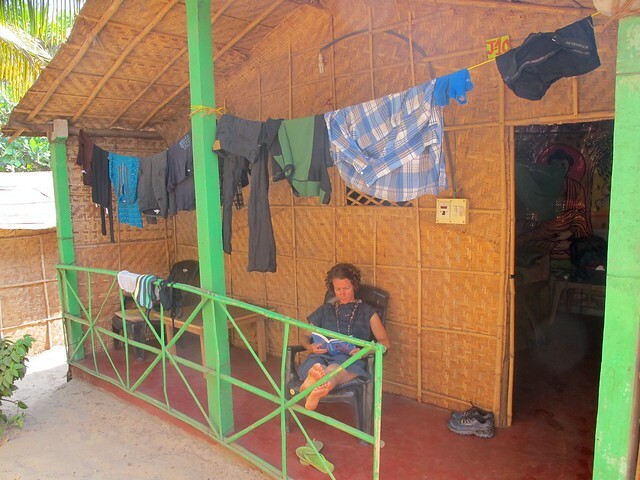 We stayed at the Laughing Buddha restaurant and beach huts. Our room was the cheapest we’ve had by far – probably because it’s constructed at the beginning of every season from bamboo with fabric featuring Buddha and Hindu gods decorating the interior walls. There is no insulation, so you hear pretty much everything around you: dogs, neighbours, restaurant kitchen, temple bells, music at your place’s restaurant, music from next door, music from down the beach … you get the idea. But you expect this from a hut on the beach that cost $9/night. What we didn’t expect was our own washroom with running water, mosquito net, fan, electricity, and a front porch with table and chairs. We were very happy that it cooled down at night (we even needed blankets), because it got pretty hot in there in the middle of the day. We didn’t do much other than read, swim, eat, and catch up on emails. 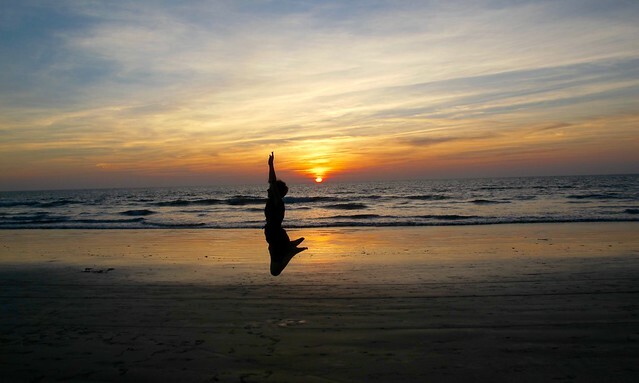 Chris went for a run, we took a yoga class, and walked up and down the beach, which was especially nice at sunset. 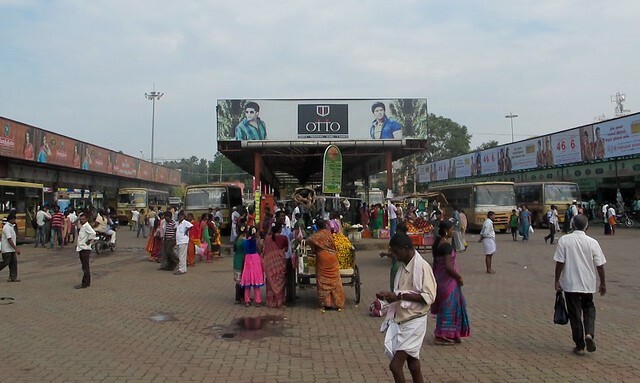 It was a nice change of pace from Hampi and some of our previous destinations. What we didn’t spend on accommodation we definitely spent on food in Arambol. 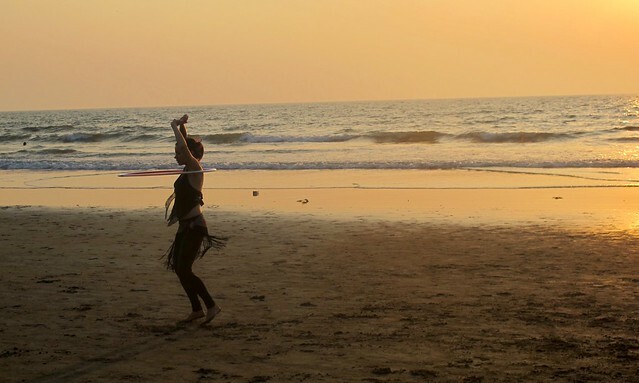 I figure this Goan subculture must support an economy of organic farms (and hula hoop manufacturers) in the region. 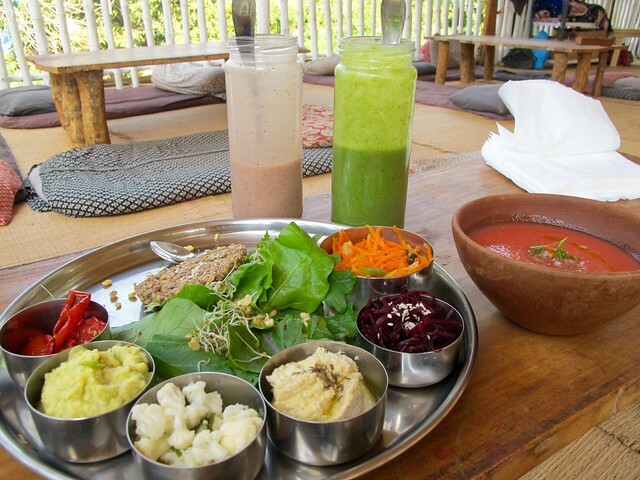 The most novel was the raw food and vegan desserts. Some of the main courses left us a little disappointed – guess our tastebuds are accustomed to the spicy flavours of Indian food. 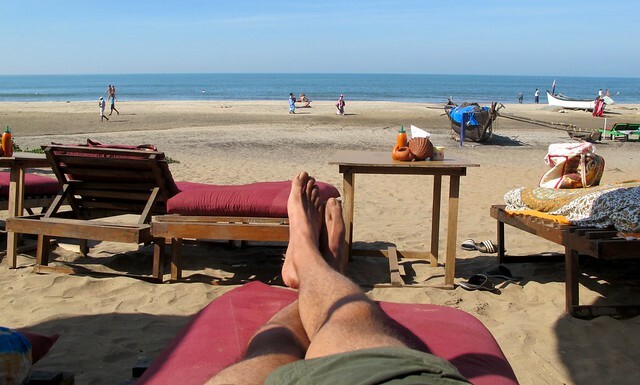 We’re off to Gokarna next for 5 more days of beach relaxation. It’s India’s Republic Day on Monday so we’re excited to see how they celebrate. 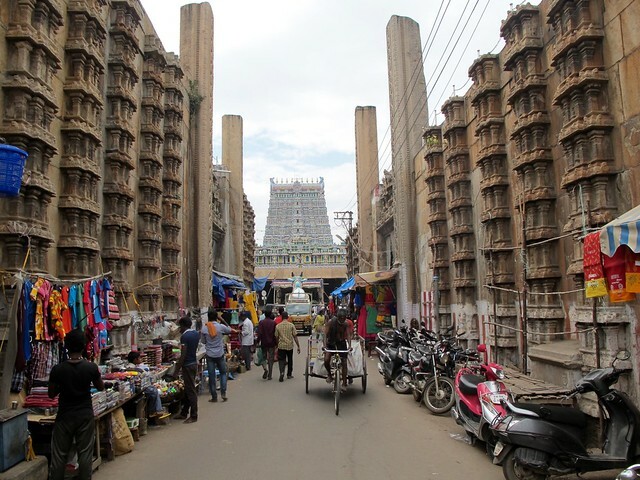 Most tourists who visit Madurai are pilgrims come to visit the Meenakshi Temple. And we felt like our foreignness was being taken advantage of at first. Our rickshaw driver tried to increase the price once we arrived at our hotel. And the price of laundry kept on increasing every time we mentioned it at the hotel or other places. 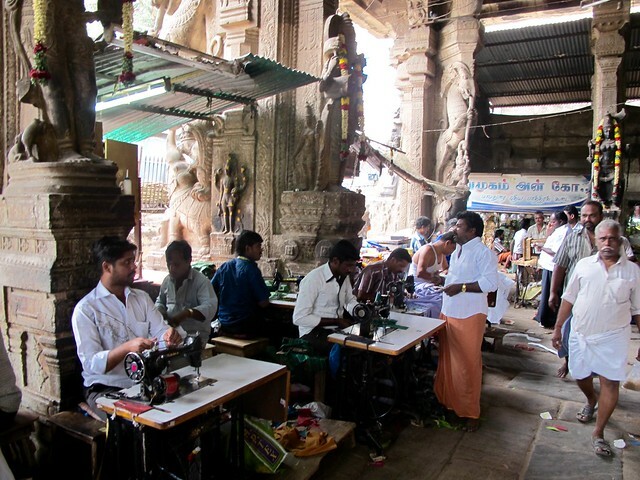 But we slowly started to see the magic that Madurai has to offer. The Meenakshi- Sundareshwarar temple is quite spectacular. It was built over hundreds of years from the sixteenth to the eighteenth centuries. 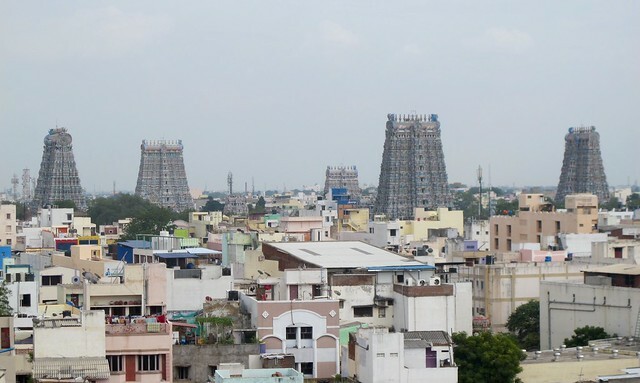 It takes up a large city block, complete with five entrances (gopuras), a lotus tank, meditation area, sculptures, a room with a thousand pillars, and shrines dedicated to Meenakshi and Shiva. 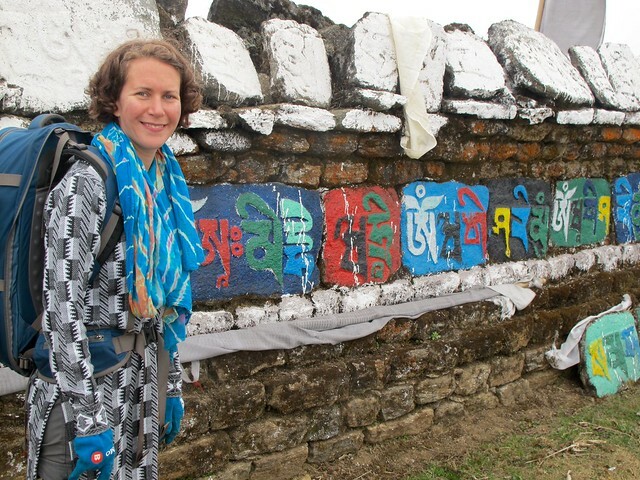 The place was more elaborate than other temples we’ve visited with a combination of natural stone carvings and painted symbols. We were a little disappointed that the main shrines are for Hindus only, but considering the thousand-person lines, we probably wouldn’t have gone anyway. We got a guide who helped explain the history, architecture, and spiritual meaning of the many carvings and shrines, including an interesting statue that pregnant mothers pour oil on to ensure childbirth is smooth. Just outside the temple was an old building, very similar in style to the temple, that was being used as a market mostly by tailors. We were surprised to see such amazing architecture used for a regular, everyday purpose. And this kept on happening, we’d turn a corner and see some really interesting building, sometimes restored as a tourist or religious site, sometimes used for government purposes, and other times holding who knows what. There were also lots of narrow alleys that were nice for walking – mostly kids playing or neighbours chatting. 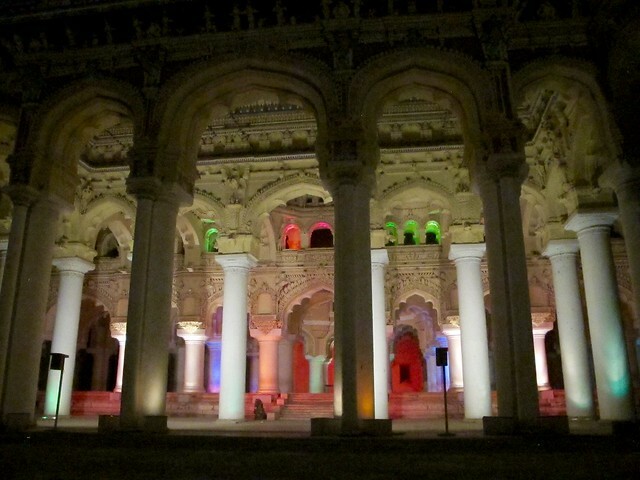 One evening we went to the Thirumalai Nayak Palace to see the sound and light show. They illuminated different areas around this large, open-air hall and told the story of a Tamil king, Shilipaddikaram, and reign of the Nayaks. It was an interesting way to learn more history and see part of the Palace. The format is quite popular here, but leaves a little something to be desired as far as evening entertainment goes. We also visited one of India’s many Gandhi museums. It told the history of India’s independence movement (with a anti-British bent) and Gandhi’s life story. It was strange how they purposefully left out how he died even though the museum holds the blood-soaked garment he was wearing. It was one of the more interesting museums we’ve visited so far but very information dense.